1. SK channels are small conductance calcium-activated potassium channels that are widely expressed in neurons. The traditional view of the functional role of SK channels is in mediating one component of the afterhyperpolarisation that follows action potentials. Calcium influx via voltage-gated calcium channels active during action potentials opens SK channels and the resultant hyperpolarisation lowers the firing frequency of action potentials in many neurons. 2. Recent advances have shown that in addition to controlling action potential firing frequency, SK channels are also important in regulating dendritic excitability, synaptic transmission and synaptic plasticity. 3. In accordance with their role in modulating synaptic plasticity, SK channels are also important in regulating several learning and memory tasks, and may also play a role in a number of neurological disorders. 4. The present review will discuss recent findings on the role of SK channels in central neurons. SK channels are calcium-activated potassium channels that have been termed as such due to their relatively small single channel conductance of approximately 10 pS.1,2 Three types of SK channels have been cloned from mammalian systems: SK1, SK2, and SK3, encoded for by KCNN1, KCNN2 and KCNN3, respectively3 (Figure 1). Each of these genes has splice variants. 20 SK1 splice variants have been detected in mouse brains.4 Two isoforms of SK2 protein have been described in the mouse brain, a short isoform and a long isoform with an extended N terminus.5 SK3 is reported to have two splice variants in human brain, with the truncated SK3 channel protein behaving as a dominant negative to SK channels.6 However, other than the truncated form of SK3, the functional roles and locations of the other SK channel splice variants are unknown. Figure 1. SK channel structure. A: Schematic diagram of the structure of one SK channel subunit. The calmodulin-binding domain resides in the C terminus. B: Alignment of human amino acid sequences of SK1-3 (shown KCNN1-3 on right). The homologous regions are outlined in boxes. Sequence accession numbers were Q5KR10 for KCNN1, Q0VFZ4 for KCNN2 and Q5VT74 for KCNN3 (NCBI). Several types of calcium-activated potassium channels are known to be present in neurons21 and SK channels were initially distinguished by their potent block by the bee venom apamin.1,22,23 The measured IC50 of SK channels for apamin is 63 pM for SK2,3 2 nM for SK3,24 and between 3.3 nM and 12 nM for SK1 channels25,26 (Table 1). SK channels are also blocked by the scorpion toxin scyllatoxin,27-29 tubocurarine, quaternary salts of bicuculline,30,31 dequalinium, UCL1848 and a large set of related bis-quinolinium cyclophanes25,32-34 (See Table 1 for IC50 values). Recently SK2 channels have been found to be selectively blocked by the scorpion toxin tamapin35 and by Lei-Dab36 (Table 1). Conversely SK channel-mediated currents can be enhanced by 1-ethyl-2-benzimidazolinone (EBIO), which enhances their calcium sensitivity and open probability37,40 and by NS30941 (Table 2). Table 1. Pharmacology of SK channel blockers. IC50 values are shown for each SK channel subunit. Table 2. Pharmacology of SK channel enhancers. EC50 values are shown for each SK channel subunit. The role of SK channels in controlling neuronal excitability through regulation of action potential discharge has been reviewed extensively elsewhere.21,52,53 Thus the present review will give an overview of this role but will focus more on the recent discoveries showing a role for SK channels in modulating dendritic excitability, synaptic transmission and plasticity and learning and memory. Figure 2. Physiological roles of SK channels in neurons, illustrated using the selective blocker apamin. A: An AHP evoked by current injection. The medium AHP is selectively blocked by apamin, leaving the slow AHP intact. B: The current underlying the AHP is evoked by a voltage step from a holding potential of -50 mV. The current underlying the medium AHP, IAHP, is blocked by apamin. 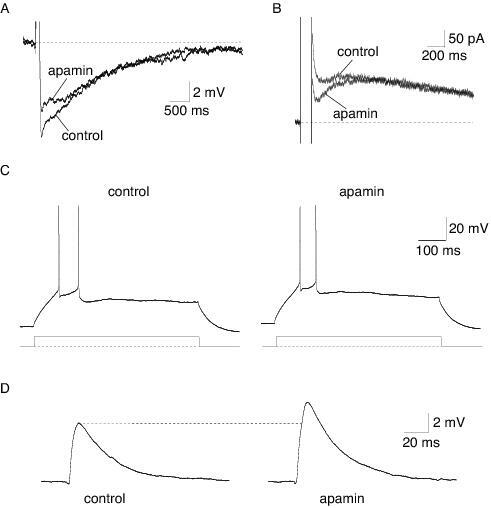 C: Apamin has no significant effect on action potential firing frequency in a pyramidal neuron in the lateral amygdala. Action potential firing was evoked by a current injection, shown below the traces. D: In lateral amygdala neurons, SK channels shunt excitatory synaptic transmission, demonstrated by an enhancement of the EPSP by apamin. Blockade of SK channels with apamin has been shown to facilitate learning in a number of behavioural paradigms.96 Since SK channels are now known to modulate both basal excitatory synaptic transmission and plasticity, this result is consistent with the view that the cellular substrate for learning and memory is synaptic plasticity.97-99 All but three studies100-102 have found that the effects of apamin are on the acquisition but not consolidation of the learning task. Blockade of SK channels by systemic administration of apamin in rats enhanced learning in an object recognition task.103 Furthermore apamin reversed a spatial navigation deficit induced by medial septum and hippocampus lesions in mice in the Morris water maze spatial memory task104,105 and improved the performance of intact mice in this task.96,75 In accordance with these studies, apamin also induced expression of the immediate early genes c-fos and c-jun in the hippocampus, genes that are thought to be the initial markers for memory formation.106 Conversely, overexpression of SK2 channels led to an impairment in the performance of rats in the Morris water maze, contextual fear conditioning and amygdala-dependent cued fear conditioning.95 In addition, apamin also enhanced learning in an appetite-motivated bar pressing response in mice101,100 and in an olfactory discrimination learning task following intracerebroventricular application of apamin.102 Finally, elevations in SK3 expression have also been shown to underlie an age-related deficit in hippocampal-mediated learning tasks.107 Together, these results show that SK channels play a key role in negatively regulating learning and memory formation in the mammalian brain. As described above, SK channels play a role in learning and memory. Thus modulators of SK channels that improve performance in learning tasks could be useful therapeutic agents to treat memory disorders and cognitive dysfunction. However at present agents that block SK channels, such as apamin, have a narrow therapeutic window. Thus new agents are required that offer less risk for therapeutic treatment.108 In fact, high doses of apamin can evoke epileptic-like activity, and agents that enhance the activity of SK channels, such as EBIO or NS309, may be useful for the treatment of epilepsy. Similarly, potentiators of SK channels could also be useful to treat emotional disorders such as phobias and depression, since enhancing SK channel activity could raise the threshold for fear conditioning,95 and apamin improves performance in the forced swimming test, which is a measure of antidepressant activity.96 Interestingly, several antidepressants, including Prozac, have a high affinity for SK channels (for review see Stocker et al.109). Many neuronal processes are associated with rises in cytosolic calcium. The exquisite sensitivity of SK channels to rises in intracellular calcium and the resultant hyperpolarisation has a multitude of effects, from terminating dendritic plateau potentials, shunting excitatory postsynaptic potentials and limiting synaptic plasticity. This myriad of actions endows a neuron with the ability to self regulate its activity and to curb excessive excitability. It is now clear that SK channels in neurons are critical in regulating both incoming information, through modulation of synaptic transmission, and outgoing information, through setting action potential discharge patterns. Thus SK channels provide an elegant mechanism of intrinsic feedback control. Understanding whether and how these channels are modulated will open up a new level of complexity in terms of regulation of neuronal excitability, synaptic plasticity and the computational abilities of neuronal circuits. 1. Blatz AL, Magleby KL. Single apamin-blocked Ca2+-activated K+ channels of small conductance in cultured rat skeletal muscle. Nature 1986; 323: 718-720. 2. Hirschberg B, Maylie J, Adelman JP, Marrion NV. Gating properties of single SK channels in hippocampal CA1 pyramidal neurons. Biophys. J. 1999; 77: 1905-13. 3. Kohler M, Hischberg B, Bond CT, Kinzie JM, Marrion NV, Maylie J, et al. Small-conductance, calcium-activated potassium channels from mammalian brain. Science 1996; 273: 1709-1714. 4. Shmukler BE, Bond CT, Wilhelm S, Bruening-Wright A, Maylie J, Adelman JP, et al. 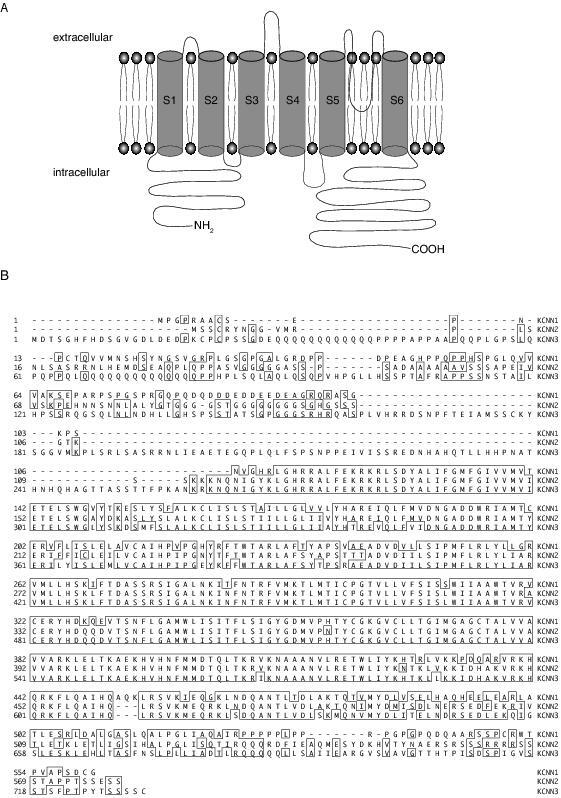 Structure and complex transcription pattern of the mouse SK1 K(Ca) channel gene, KCNN1. Biochem. Biophys. Acta 2001; 1518: 36-46. 5. Strassmaier T, Bond CT, Sailer CA, Knaus HG, Maylie J, Adelman JP. A novel isoform of SK2 assembles with other SK subunits in mouse brain. J. Biol. Chem. 2005; 280: 21231-6. 6. Tomita H, Shakkottai VG, Gutman GA, Sun G, Bunney WE, Cahalan MD, et al. Novel truncated isoform of SK3 potassium channel is a potent dominant-negative regulator of SK currents: implications in schizophrenia. Mol. Psychiatry 2003; 8: 524-35. 7. Park Y-B. Ion selectivity and gating of small conductance Ca2+-activated K+ channels in cultured rat adrenal chromaffin cells. J. Physiol. 1994; 481: 555-570. 8. Vegara C, Latorre R, Marrion NV, Adelman JP. Calcium-activated potassium channels. Curr. Opin. Neurobiol. 1998; 8: 321-329. 9. Xia X-M, Falker B, Rivard A, Wayman G, Johnson-Pais T, Keen JE, et al. Mechanism of calcium gating in small-conductance calcium-activated potassium channels. Nature 1998; 395: 503-507. 10. Keen JE, Khawaled R, Farrens DL, Neelands T, Rivard A, Bond CT, et al. Domains responsible for constitutive and Ca2+-dependent interactions between calmodulin and small conductance Ca2+-activated potassium channels. J. Neurosci. 1999; 19: 8830-8. 11. Schumacher MA, Rivard AF, Bachinger HP, Adelman JP. Structure of the gating domain of a Ca2+-activated K+ channel complexed with Ca2+/calmodulin. Nature 2001; 410: 1120-1124. 12. Stocker M, Krause M, Pedarzani P. An apamin-sensitive Ca2+-activated K+ current in hippocampal pyramidal neurons. P.N.A.S. USA 1999; 96: 4662-4667. 13. Stocker M, Pedarzani P. Differential distributions of three Ca2+-activated K+ channel subunits, SK1, SK2 and SK3 in the adult rat central nervous system. Mol. Cell. Neurosci. 2000; 15: 476-493. 14. Bowden SE, Fletcher S, Loane DJ, Marrion NV. Somatic co-localization of rat SK1 and D class (Ca(v)1.2) L-type calcium channels in rat CA1 hippocampal pyramidal neurons. J. Neurosci. 2001; 21: RC175. 15. Sailer CA, Hu H, Kaufmann WA, Trieb M, Schwarzer C, Storm JF, et al. Regional differences in distribution and functional expression of small-conductance Ca2+-activated K+ channels in rat brain. J. Neurosci. 2002; 22: 9698-707. 16. Hirschberg B, Maylie J, Adelman JP, Marrion NV. Gating of recombinant small-conductance Ca2+-activated K+ channels by calcium. J. Gen. Physiol. 1998; 111: 565-581. 17. Monaghan AS, Benton DC, Bahia PK, Hosseini R, Shah YA, Haylett DG, et al. The SK3 subunit of small conductance Ca2+-activated K+ channels interacts with both SK1 and SK2 subunits in a heterologous expression system. J. Biol. Chem. 2004; 279: 1003-9. 18. Benton DC, Monaghan AS, Hosseini R, Bahia PK, Haylett DG, Moss GW. Small conductance Ca2+-activated K+ channels formed by the expression of rat SK1 and SK2 genes in HEK 293 cells. J. Physiol. 2003; 553: 13-9. 19. Wolfart J, Neuhoff H, Franz O, Roeper J. Differential expression of the small-conductance, calcium-activated potassium channel SK3 is critical for pacemaker control in dopaminergic midbrain neurons. J. Neurosci. 2001; 21: 3443-56. 20. Pedarzani P, Kulik A, Muller M, Ballanyi K, Stocker M. Molecular determinants of Ca2+-dependent K+ channel function in rat dorsal vagal neurones. J. Physiol. 2000; 527: 283-290. 21. Sah P, Faber ESL. Channels underlying neuronal calcium-activated potassium currents. Prog. Neurobiol. 2002; 66: 345-53. 22. Burgess GM, Claret M, Jenkinson DH. Effects of quinine and apamin on the calcium-dependent potassium permeability of mammalian hepatocytes and red cells. J. Physiol. 1981; 317: 67-90. 23. Romey G, Hugues M, Schmid-Antomarchi H, Lazdunski M. Apamin: a specific toxin to study a class of Ca2+-dependent K+ channels. J. Physiol. 1984; 79: 259-64. 24. Ishii TM, Maylie J, Adelman JP. Determinants of apamin and d-tubocurarine block in SK potassium channels. J. Biol. Chem. 1997; 272: 23195-23200. 25. Shah M, Haylett DG. The pharmacology of hSK1 Ca2+-activated K+ channels expressed in mammalian cell lines. Br. J. Pharmacol. 2000; 129: 627-630. 26. Strobaek D, Jorgensen TD, Christophersen P, Ahring PK, Olesen S-P. Pharmacological characterization of small-conductance Ca2+-activated K+ channels stably expressed in HEK 293 cells. Br. J. Pharmacol. 2000; 129: 991-999. 27. Castle NA, Strong PN. Identification of two toxins from scorpion (Leiurus quinquestriatus) venom which block distinct classes of calcium-activated potassium channel. FEBS Lett. 1986; 209: 117-21. 28. Chicchi GG, Gimenez-Gallego G, Ber E, Garcia ML, Winquist R, Cascieri MA. Purification and characterization of a unique, potent inhibitor of apamin binding from Leiurus quinquestriatus hebraeus venom. J. Biol. Chem. 1988; 263: 10192-7. 29. Auguste P, Hugues M, Grave B, Gesquiere JC, Maes P, Tartar A, et al. Leiurotoxin I (scyllatoxin), a peptide ligand for Ca2+-activated K+ channels. Chemical synthesis, radiolabeling, and receptor characterization. J. Biol. Chem. 1990; 265: 4753-9. 30. Johnson SW, Seutin V. Bicuculline methiodide potentiates NMDA-dependent burst firing in rat dopamine neurons by blocking apamin-sensitive Ca2+-activated K+ currents. Neurosci. Lett. 1997; 231: 13-16. 31. Seutin V, Johnson SW. Recent advances in the pharmacology of quaternary salts of bicuculline. Trends Pharmacol. Sci. 1999; 20: 268-70. 32. Campos Rosa J, Galanakis D, Piergentili A, Bhandari K, Ganellin CR, Dunn PM, et al. Synthesis, molecular modeling, and pharmacological testing of bis-quinolinium cyclophanes: potent, non-peptidic blockers of the apamin-sensitive Ca2+-activated K+ channel. J. Med. Chem. 2000; 43: 420-431. 33. Chen J-Q, Galanakis D, Ganellin CR, Dunn PM, Jenkinson DH. bis-Quinolinium Cyclophanes: 8,14-diaza-1,7(1,4)-diquinolinacyclotetradecaphane (UCL 1848), a highly potent and selective, nonpeptidic blocker of the apamin-sensitive Ca2+-activated K+ channel. J. Med. Chem. 2000; 43: 3478-3481. 34. Dunn PM. Dequalinium, a selective blocker of the slow afterhyperpolarization in rat sympathetic neurones in culture. Eur. J. Pharmacol. 1994; 252: 189-194. 35. Pedarzani P, D'Hoedt D, Doorty KB, Wadsworth JD, Joseph JS, Jeyaseelan K, et al. Tamapin, a venom peptide from the Indian red scorpion (Mesobuthus tamulus) that targets small conductance Ca2+-activated K+ channels and afterhyperpolarization currents in central neurons. J. Biol. Chem. 2002; 277: 46101-9. 36. Shakkottai VG, Regaya I, Wulff H, Fajloun Z, Tomita H, Fathallah M, et al. Design and characterization of a highly selective peptide inhibitor of the small conductance calcium-activated K+ channel, SKCa2. J. Biol. Chem. 2001; 276: 43145-51. 37. Olesen SP, Munch E, Moldt P, Drejer J. Selective activation of Ca2+-dependent K+ channels by novel benzimidazolone. Eur. J. Pharmacol. 1994; 251: 53-9. 38. Pedarzani P, Mosbacher J, Rivard A, Cingolani LA, Oliver D, Stocker M, et al. Control of electrical activity in central neurons by modulating the gating of small conductance Ca2+-activated K+ channels. J. Biol. Chem. 2001; 276: 9762-9769. 39. Syme CA, Gerlach AC, Singh AK, Devor DC. Pharmacological activation of cloned intermediate- and small-conductance Ca2+-activated K+ channels. Am. J. Physiol. 2000; 278: C570-581. 40. Faber ESL, Sah P. Physiological role of calcium-activated potassium currents in the rat lateral amygdala. J. Neurosci. 2002; 22: 1618-28. 41. Pedarzani P, McCutcheon JE, Rogge G, Jensen BS, Christophersen P, Hougaard C, et al. Specific enhancement of SK channel activity selectively potentiates the afterhyperpolarizing current IAHP and modulates the firing properties of hippocampal pyramidal neurons. J. Biol. Chem. 2005; 280: 41404-11. 42. Bildl W, Strassmaier T, Thurm H, Andersen J, Eble S, Oliver D, et al. Protein kinase CK2 is coassembled with small conductance Ca2+-activated K+ channels and regulates channel gating. Neuron 2004; 43: 847-58. 43. Ren Y, Barnwell LF, Alexander JC, Lubin FD, Adelman JP, Pfaffinger PJ, et al. Regulation of surface localization of the small conductance Ca2+-activated potassium channel, SK2, through direct phosphorylation by cAMP-dependent protein kinase. J. Biol. Chem. 2006; 281: 11769-79. 44. Khawaled R, Bruening-Wright A, Adelman JP, Maylie J. Bicuculline block of small-conductance calcium-activated potassium channels. Pflügers Arch. 1999; 438: 314-21. 45. Terstappen GC, Pula G, Carignani C, Chen MX, Roncarati R. Pharmacological characterisation of the human small conductance calcium-activated potassium channel hSK3 reveals sensitivity to tricyclic antidepressants and antipsychotic phenothiazines. Neuropharmacology 2001; 40: 772-83. 46. Grunnet M, Jespersen T, Angelo K, Frokjaer-Jensen C, Klaerke DA, Olesen SP, et al. Pharmacological modulation of SK3 channels. Neuropharmacology 2001; 40: 879-87. 47. Hosseini R, Benton DCH, Dunn PM, Jenkinson DH, Moss GWJ. SK3 is an important component of K+ channels mediating the afterhyperpolarization in cultured rat SCG neurones. J. Physiol. 2001; 535: 323-34. 48. Dreixler JC, Bian J, Cao Y, Roberts MT, Roizen JD, Houamed KM. Block of rat brain recombinant SK channels by tricyclic antidepressants and related compounds. Eur. J. Pharmacol. 2000; 401: 1-7. 49. Heusser K, Schwappach B. Trafficking of potassium channels. Curr. Opin. Neurobiol. 2005; 15: 364-9. 50. Licata L, Haase W, Eckhardt-Strelau L, Parcej DN. Over-expression of a mammalian small conductance calcium-activated K+ channel in Pichia pastoris: effects of trafficking signals and subunit fusions. Protein Expr. Purif. 2006; 47: 171-8. 51. Misonou H, Trimmer JS. Determinants of voltage-gated potassium channel surface expression and localization in Mammalian neurons. Crit. Rev. Biochem. Mol. Biol. 2004; 39: 125-45. 52. Faber ESL, Sah P. Calcium-activated potassium channels: multiple contributions to neuronal function. Neuroscientist 2003; 9: 181-94. 53. Bond CT, Maylie J, Adelman JP. SK channels in excitability, pacemaking and synaptic integration. Curr. Opin. Neurobiol. 2005; 15: 305-11. 54. Lancaster B, Nicoll RA. Properties of two calcium-activated hyperpolarizations in rat hippocampal neurones. J. Physiol. 1987; 389: 187-204. 55. Storm JF. Action potential repolarization and a fast after-hyperpolarization in rat hippocampal pyramidal cells. J. Physiol. 1987; 385: 733-759. 56. Storm JF. Potassium currents in hippocampal pyramidal cells. Prog. Brain Res. 1990; 83: 161-187. 57. Sah P. Ca2+-activated K+ currents in neurones: types, physiological roles and modulation. Trends in Neurosci. 1996; 19: 150-154. 58. Marrion NV, Tavalin SJ. Selective activation of Ca2+-activated K+ channels by co-localised Ca2+ channels in hippocampal neurons. Nature 1998; 395: 900-905. 59. Adams PR, Constanti A, Brown DA, Clark RB. Intracellular Ca2+ activates a fast voltage-sensitive K+ current in vertebrate sensory neurones. Nature 1982; 296: 746-749. 60. Pennefather P, Lancaster B, Adams PR, Nicoll RA. Two distinct Ca2+-dependent K+ currents in bullfrog sympathetic ganglionic cells. P.N.A.S. USA 1985; 82: 3040-3044. 61. Sah P, McLachlan EM. Ca2+-activated K+ currents underlying the afterhyperpolarization in guinea pig vagal neurons: A role for Ca2+-activated Ca2+ release. Neuron 1991; 7: 257-264. 62. Sah P, McLachlan EM. Potassium currents contributing to action potential repolarization and the afterhyperpolarization in rat vagal motoneurons. J. Neurophysiol. 1992; 68: 1834-1841. 63. Schwindt PC, Spain WJ, Foehring RC, Stafstrom CE, Chubb MC, Crill WE. Multiple potassium conductances and their functions in neurons from cat sensorimotor cortex in vitro. J. Neurophysiol. 1988; 59: 424-449. 64. Storm JF. An after-hyperpolarization of medium duration in rat hippocampal pyramidal cells. J. Physiol. 1989; 409: 171-190. 65. Williamson A, Alger BE. Characterization of an early afterhyperpolarization after a brief train of action potentials in rat hippocampal neurons in vitro. J. Neurophysiol. 1990; 63: 72-81. 66. Sah P. Different calcium channels are coupled to potassium channels with distinct physiological roles in vagal neurons. Proceed. Royal Soc. London 1995; 260: 105-111. 67. Viana F, Bayliss DA, Berger AJ. Multiple potassium conductances and their role in action potential repolarization and repetitive firing behavior of neonatal rat hypoglossal motoneurons. J. Neurophysiol. 1993; 69: 2150-2163. 68. Davies PJ, Ireland DR, McLachlan EM. Sources of Ca2+ for different Ca2+-activated K+ conductances in neurones of the rat superior cervical ganglion. J. Physiol. 1996; 495: 353-66. 69. Tanabe M, Gahwiler BH, Gerber U. L-type Ca2+ channels mediate the slow Ca2+-dependent afterhyperpolarisation current in rat CA3 pyramidal cells in vitro. J. Neurophysiol. 1998; 80: 2268-2273. 70. Faber ESL, Sah P. Independent roles of calcium and voltage-dependent potassium currents in controlling spike frequency adaptation in lateral amygdala pyramidal neurons. Eur. J. Neurosci. 2005; 22: 1627-35. 71. Bond CT, Herson PS, Strassmaier T, Hammond R, Stackman R, Maylie J, et al. Small conductance Ca2+-activated K+ channel knock-out mice reveal the identity of calcium-dependent afterhyperpolarization currents. J. Neurosci. 2004; 24: 5301-6. 72. Villalobos C, Shakkottai VG, Chandy KG, Michelhaugh SK, Andrade R. SKCa channels mediate the medium but not the slow calcium-activated afterhyperpolarization in cortical neurons. J. Neurosci. 2004; 24: 3537-42. 73. Kato M, Tanaka N, Usui S, Sakuma Y. The SK channel blocker apamin inhibits slow afterhyperpolarization currents in rat gonadotropin-releasing hormone neurones. J. Physiol. 2006; 574: 431-42. 74. Osmanovic SS, Shefner SA, Brodie MS. Functional significance of the apamin-sensitive conductance in rat locus coeruleus neurons. Brain Res. 1990; 530: 283-9. 75. Stackman RW, Hammond RS, Linardatos E, Gerlach A, Maylie J, Adelman JP, et al. Small conductance Ca2+-activated K+ channels modulate synaptic plasticity and memory encoding. J. Neurosci. 2002; 22: 10163-71. 76. Seutin V, Johnson SW, North RA. Apamin increases NMDA-induced burst-firing of rat mesencephalic dopamine neurons. Brain Res. 1993; 630: 341-4. 77. Shepard PD, Bunney BS. Repetitive firing properties of putative dopamine-containing neurons in vitro: regulation by an apamin-sensitive Ca2+-activated K+ conductance. Exp. Brain Res.1991; 86: 141-50. 78. Waroux O, Massotte L, Alleva L, Graulich A, Thomas E, Liegeois JF, et al. SK channels control the firing pattern of midbrain dopaminergic neurons in vivo. Eur. J. Neurosci. 2005; 22: 3111-21. 79. Bal T, McCormick DA. Mechanisms of oscillatory activity in guinea-pig nucleus reticularis thalami in vitro: a mammalian pacemaker. J. Physiol. 1993; 468: 669-91. 80. Bal T, McCormick DA. Synchronized oscillations in the inferior olive are controlled by the hyperpolarization-activated cation current I(h). J. Neurophysiol. 1997; 77: 3145-56. 81. Zhang L, Krnjevic K. Apamin depresses selectively the after-hyperpolarization of cat spinal motoneurons. Neurosci. Lett. 1987; 74: 58-62. 82. Maher BJ, Westbrook GL. SK channel regulation of dendritic excitability and dendrodendritic inhibition in the olfactory bulb. J. Neurophysiol. 2005; 94: 3743-50. 83. Fiorillo CD, Williams JT. Glutamate mediates an inhibitory postsynaptic potential in dopamine neurons. Nature 1998; 394: 78-82. 84. Yamada S, Takechi H, Kanchiku I, Kita T, Kato N. Small-conductance Ca2+-dependent K+ channels are the target of spike-induced Ca2+ release in a feedback regulation of pyramidal cell excitability. J. Neurophysiol. 2004; 91: 2322-9. 85. Gulledge AT, Stuart GJ. Cholinergic inhibition of neocortical pyramidal neurons. J. Neurosci. 2005; 25: 10308-20. 86. Cai X, Liang CW, Muralidharan S, Kao JP, Tang CM, Thompson SM. Unique roles of SK and Kv4.2 potassium channels in dendritic integration. Neuron 2004; 44: 351-64. 87. Grillner S, Wallen P, Hill R, Cangiano L, El Manira A. Ion channels of importance for the locomotor pattern generation in the lamprey brainstem-spinal cord. J. Physiol. 2001; 533: 23-30. 88. Cangiano L, Wallen P, Grillner S. Role of apamin-sensitive KCa channels for reticulospinal synaptic transmission to motoneuron and for the afterhyperpolarization. J. Neurophysiol. 2002; 88: 289-99. 89. Oliver D, Klocker N, Schuck J, Baukrowitz T, Ruppersberg JP, Fakler B. Gating of Ca2+-activated K+ channels controls fast inhibitory synaptic transmission at auditory outer hair cells. Neuron 2000; 26: 595-601. 90. Faber ESL, Delaney AJ, Sah P. SK channels regulate excitatory synaptic transmission and plasticity in the lateral amygdala. Nat. Neurosci. 2005; 8: 635-41. 91. Ngo-Anh TJ, Bloodgood BL, Lin M, Sabatini BL, Maylie J, Adelman JP. SK channels and NMDA receptors form a Ca2+-mediated feedback loop in dendritic spines. Nat. Neurosci. 2005; 8: 642-9. 92. Norris CM, halpain S, Foster TC. Reversal of age-related alterations in synaptic plasticity by blockade of L-type Ca2+ channels. J. Neurosci. 1998; 18: 3171-3179. 93. Behnisch T, Reymann KG. Inhibition of apamin-sensitive calcium dependent potassium channels facilitate the induction of long-term potentiation in the CA1 region of rat hippocampus in vitro. Neurosci. Lett. 1998; 253: 91-4. 94. Kramar EA, Lin B, Lin CY, Arai AC, Gall CM, Lynch G. A novel mechanism for the facilitation of theta-induced long-term potentiation by brain-derived neurotrophic factor. J. Neurosci. 2004; 24: 5151-61. 95. Hammond RS, Bond CT, Strassmaier T, Ngo-Anh TJ, Adelman JP, Maylie J, et al. Small-conductance Ca2+-activated K+ channel type 2 (SK2) modulates hippocampal learning, memory, and synaptic plasticity. J. Neurosci. 2006; 26: 1844-53. 96. van der Staay FJ, Fanelli RJ, Blokland A, Schmidt BH. Behavioral effects of apamin, a selective inhibitor of the SKCa-channel, in mice and rats. Neurosci. Biobehav. Rev. 1999; 23: 1087-110. 97. Moser EI, Krobert KA, Moser MB, Morris RG. Impaired spatial learning after saturation of long-term potentiation. Science 1998; 281: 2038-42. 98. Pastalkova E, Serrano P, Pinkhasova D, Wallace E, Fenton AA, Sacktor TC. Storage of spatial information by the maintenance mechanism of LTP. Science 2006; 313: 1141-4. 99. Whitlock JR, Heynen AJ, Shuler MG, Bear MF. Learning induces long-term potentiation in the hippocampus. Science 2006; 313: 1093-7. 100. Messier C, Mourre C, Bontempi B, Sif J, Lazdunski M, Destrade C. Effect of apamin, a toxin that inhibits Ca2+-dependent K+ channels, on learning and memory processes. Brain Res. 1991; 551: 322-6. 101. Belcadi-Abbassi W, Destrade C. Post-test apamin injection suppresses a Kamin-like effect following a learning session in mice. Neuroreport 1995; 6: 1293-6. 102. Fournier C, Kourrich S, Soumireu-Mourat B, Mourre C. Apamin improves reference memory but not procedural memory in rats by blocking small conductance Ca2+-activated K+ channels in an olfactory discrimination task. Behav. Brain Res. 2001; 121: 81-93. 103. Deschaux O, Bizot JC, Goyffon M. Apamin improves learning in an object recognition task in rats. Neurosci. Lett. 1997; 222: 159-62. 104. Ikonen S, Schmidt B, Riekkinen P, Jr. Apamin improves spatial navigation in medial septal-lesioned mice. Eur. J. Pharmacol. 1998; 347: 13-21. 105. Ikonen S, Riekkinen P, Jr. Effects of apamin on memory processing of hippocampal-lesioned mice. Eur. J. Pharmacol. 1999; 382: 151-6. 106. Heurteaux C, Messier C, Destrade C, Lazdunski M. Memory processing and apamin induce immediate early gene expression in mouse brain. Brain Res. Mol. Brain Res. 1993; 18: 17-22. 107. Blank T, Nijholt I, Kye MJ, Radulovic J, Spiess J. Small-conductance, Ca2+-activated K+ channel SK3 generates age-related memory and LTP deficits. Nat. Neurosci. 2003; 6: 911-2. 108. Liegeois JF, Mercier F, Graulich A, Graulich-Lorge F, Scuvee-Moreau J, Seutin V. Modulation of small conductance calcium-activated potassium (SK) channels: a new challenge in medicinal chemistry. Curr. Med. Chem. 2003; 10: 625-47. 109. Stocker M, Hirzel K, D'Hoedt D, Pedarzani P. Matching molecules to function: neuronal Ca2+-activated K+ channels and afterhyperpolarizations. Toxicon 2004; 43: 933-49. 110. Gargus JJ, Fantino E, Gutman GA. A piece in the puzzle: an ion channel candidate gene for schizophrenia. Mol. Med. Today 1998; 4: 518-24. 111. Chandy KG, Fantino E, Wittekindt O, Kalman K, Tong LL, Ho TH, et al. Isolation of a novel potassium channel gene hSKCa3 containing a polymorphic CAG repeat: a candidate for schizophrenia and bipolar disorder? Mol. Psychiatry 1998; 3: 32-7. 112. Dror V, Shamir E, Ghanshani S, Kimhi R, Swartz M, Barak Y, et al. hKCa3/KCNN3 potassium channel gene: association of longer CAG repeats with schizophrenia in Israeli Ashkenazi Jews, expression in human tissues and localization to chromosome 1q21. Mol. Psychiatry 1999; 4: 254-60. 113. Ritsner M, Modai I, Ziv H, Amir S, Halperin T, Weizman A, et al. An association of CAG repeats at the KCNN3 locus with symptom dimensions of schizophrenia. Biol. Psychiatry 2002; 51: 788-94. 114. Miller MJ, Rauer H, Tomita H, Rauer H, Gargus JJ, Gutman GA, et al. Nuclear localization and dominant-negative suppression by a mutant SKCa3 N-terminal channel fragment identified in a patient with schizophrenia. J. Biol. Chem. 2001; 276: 27753-6. Received 26 January 2007, in revised form 10 April 2007. Accepted 12 April 2007.